The OX-05 design incorporates useful features for both Hunters and Tactical users alike. TOPS Outfitter 5" Utility Hand Axe or OX-05 Hatchet, was designed by a collaboration effort between Dave Burnell (a former Air Force Search and Rescue Operative and CEO of OPS Gear) and Allen Jensen, (a Youth Survival Instructor who has worked with various Idaho Guides and Outfitters for more than fifteen years). The OX-05 design incorporates useful features for both Hunters and Tactical Users alike. 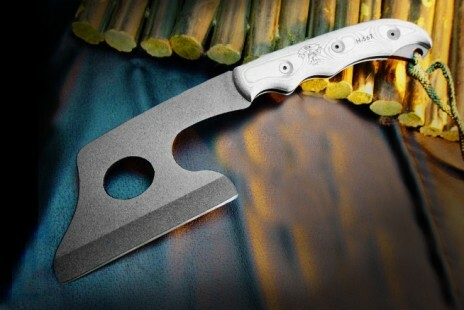 The straight 5" blade will chop like a meat cleaver as well as hew like a broad axe. The Black Linen Micarta Handle provides a comfortable grip with good traction even when wet or bloody. The oval hole in the head allows the user's fingers to make a firm grip, close to the blade for delicate knife work, as well as providing a possible way to lash the OX-05 to a pack or saddle. The provided Kydex Heavy Duty LBE Sheath with "Jump Pin" secures the hatchet solidly while still providing fast access when needed. Made of 1/4" 1095 High Carbon Steel and weighing just 30 ounces the 14 1/4" OX-05 provides enough forward mass to chop very efficiently, but yet still weigh about the same as most heavy use knives of the same length. The smooth back allows for limited use as a hammer while providing constant control when changing from use as a knife to a hatchet in one continuous motion.